This year, our journey through the Lenten fast to Pascha begins at Forgiveness Vespers on Sunday, March 10. The Church, in her wisdom, begins preparing us for this most-holy time in the weeks that precede the fast. This post will provide you with the fasting guidelines for the pre-Lenten period of preparation, Great Lent, and Holy Week, according to the general practice of All Saints parish and as approved for publication by Fr. Nicholas Sorensen. The guidelines in this post are general. Fasting is a spiritual discipline that should be practiced with the oversight and direction of your spiritual father. If you have any specific questions about how the fasting discipline applies to you, you should consult your spiritual father. In the case of All Saints parishioners, your spiritual father is Fr. Nicholas. February 17 is the Sunday of the Publican and Pharisee and the week that follows (February 18 – 24) is fast-free. There is no Wednesday or Friday fast this week. February 24 is the Sunday of the Prodigal Son and the week that follows (February 25 – March 3) is a normal week. Wednesday and Friday of this week are fasting days. March 3 is Meatfare Sunday (the Sunday of the Last Judgment) and on this day we say “farewell” to meat. During the week that follows (March 4 – 10) we fast from meat only. All dairy, cheese, eggs, wine, and oil are permitted during this week, even on Wednesday and Friday. March 10 is Cheesefare Sunday (the Sunday of Forgiveness) and on this day we say “farewell” to cheese, dairy, eggs, wine, oil, etc. This begins the fast proper. WEEKDAYS (Monday – Friday) are observed as Strict Fast Days. On these days we abstain from meat, dairy, fish with backbones, fowl, alcoholic beverages, and oil. WEEKENDS (Saturday and Sunday) are observed as Wine and Oil Days. On these days the fast is relaxed to permit alcoholic beverages and olive and other vegetable oils. In addition, two special feastdays that fall during this period – Annunciation (March 25) and Palm Sunday (April 21, this year) – are kept as Fish, Wine, and Oil Days. On these days the fast is relaxed to permit fish with backbones, in addition to alcoholic beverages and oil. There are certain days of the Holy Week cycle that have special fasting rules. Great and Holy Thursday (April 25, this year) is observed as a Wine and Oil Day due to the commemoration of the institution of the Eucharist. Great and Holy Saturday (April 27, this year) is observed as a Strict Fast Day – the only Saturday of the year kept as a strict fast; however, wine (but not oil) is permitted. Fasting on the weekdays of the first week of Great Lent is especially severe. The strictest observance would be to take only two meals during this week – one on Wednesday evening and one on Friday evening after the services scheduled for those nights – keeping Pure Monday, Tuesday, and Thursday as absolute fasts (i.e., no food whatsoever). For many this is impracticable. A good starting place to work towards the strict observance is to keep the first day of Great Lent, Pure Monday, as an absolute fast and to limit meals on the other days. It is a pious practice to observe Great and Holy Friday as an absolute fast. If one does not have the strength to do this, it is good to abstain from food until after venerating the epitaphios (winding sheet) during Vespers on this day. Before you attempt to strictly follow the fasting guidelines, consult with Fr. Nicholas. It is very easy to lose sight of the fact that fasting is merely a means to an end (that is, our salvation) and not an end in itself. The Nativity Fast begins this year on Thursday, November 15. This fast helps us prepare to properly celebrate our Lord’s nativity in the flesh and it is to our benefit to observe it as fully as possible. Following are the guidelines for this fast, according to the general practice of All Saints parish and as approved for publication by Fr. Nicholas. These guidelines are general. Fasting is a spiritual discipline that should be practiced with the oversight and direction of your spiritual father. You should consult your spiritual father if you have any specific questions about the fasting discipline as it applies to you. Remember that almsgiving is a special part of this particular fast. Further, limiting one’s entertainments and increasing other aspects of one’s spiritual life – prayer, reading of the Bible and Church Fathers, attendance at Divine Services – is a part of every fast. THANKSGIVING DAY — Our bishops have decreed that the faithful of the Antiochian Archdiocese in the USA may relax the fast entirely to observe the Thanksgiving Day national celebration, which falls on November 22 this year. MONDAYs, WEDNESDAYs, and FRIDAYs of this fast are Strict Fast days. On these days we abstain from meat, dairy, fish with backbones, fowl, alcoholic beverages, and olive oil. TUESDAYs and THURSDAYs of the fast are Wine and Oil days. On these days the fasting discipline is relaxed a bit to permit wine and olive oil. SATURDAYs and SUNDAYs of the fast are Fish, Wine, and Oil days. On these days the fast is relaxed even more to permit fish with backbones in addition to wine and oil. During the forefeast of the Nativity, from December 20-24, our fasting is more strict. Each weekday that falls during this period is generally kept as a Strict Fast day, while any Saturday or Sunday is observed as a Wine and Oil day. The Eve of the Feast, December 24, however, is always kept as a Strict Fast day. Foods that are permitted on all days are vegetables, fruits, grains, nuts, and shellfish. The fasting discipline varies from the general guidelines noted above according to the commemoration of the day. The feast of the Entrance of the Theotokos into the Temple, November 21, is always kept as a Fish, Wine, and Oil day, no matter what day of the week it falls on. … the eye and the ear and the feet and the hands and all the members of our bodies. Let the ear fast, by not listening to evil talk and gossip. For what good is it if we abstain from birds and fishes, but bite and devour our brothers? On Monday, June 4, we begin the Apostles’ Fast, one of the four canonical fasting periods of the Church year. The Apostles’ Fast always begins the Monday following All Saints Sunday and ends on June 29, the feastday of Ss. Peter and Paul, Chiefs of the Apostles. The duration of this fast varies each year depending on the date of Pascha (which determines the date of All Saints). This year, our journey through the Lenten fast to Pascha begins at Forgiveness Vespers on Sunday, February 18. The Church, in her wisdom, begins preparing us for this most-holy time in the weeks that precede the fast. This post will provide you with the fasting guidelines for the pre-Lenten period of preparation, Great Lent, and Holy Week, according to the general practice of All Saints parish and as approved for publication by Fr. Nicholas Sorensen. January 28 is the Sunday of the Publican and Pharisee and the week that follows (January 29 – February 4) is fast-free. There is no Wednesday or Friday fast this week. February 4 is the Sunday of the Prodigal Son and the week that follows (February 5 – 11) is a normal week. Wednesday and Friday of this week are fasting days. February 11 is Meatfare Sunday (the Sunday of the Last Judgment) and on this day we say “farewell” to meat. During the week that follows (February 12 – 18) we fast from meat only. All dairy, cheese, eggs, wine, and oil are permitted during this week, even on Wednesday and Friday. February 18 is Cheesefare Sunday (the Sunday of Forgiveness) and on this day we say “farewell” to cheese, dairy, eggs, wine, oil, etc. This begins the fast proper. In addition, two special feastdays that fall during this period – Annunciation (March 25) and Palm Sunday (April 1, this year) – are kept as Fish, Wine, and Oil Days. On these days the fast is relaxed to permit fish with backbones, in addition to alcoholic beverages and oil. Great and Holy Thursday (April 5, this year) is observed as a Wine and Oil Day due to the commemoration of the institution of the Eucharist. Great and Holy Saturday (April 7, this year) is observed as a Strict Fast Day – the only Saturday of the year kept as a strict fast; however, wine (but not oil) is permitted. The Nativity Fast begins this year on Wednesday, November 15. This fast helps us prepare to properly celebrate our Lord’s nativity in the flesh and it is to our benefit to observe it as fully as possible. 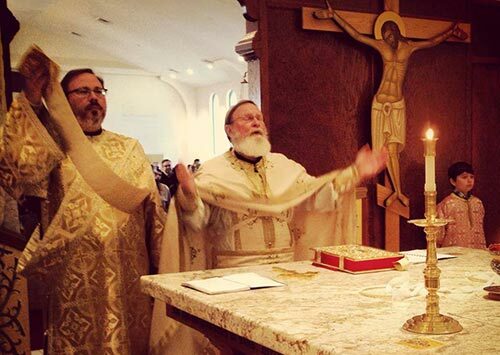 THANKSGIVING DAY — Our bishops have decreed that the faithful of the Antiochian Archdiocese in the USA may relax the fast entirely to observe the Thanksgiving Day national celebration, which falls on November 23 this year. On Tuesday, August 15, we will celebrate the Dormition of our Most Holy Lady, the Theotokos and Ever-virgin Mary. In preparation for this great feast of the Mother of God, we observe a two-week period of fasting from August 1-14. Following are the fasting guidelines for the Dormition Fast for this year, according to the general practice of All Saints parish and as approved for publication by Fr. Nicholas Sorensen. Note that these fasting guidelines are general. Fasting is a spiritual discipline that should be practiced with the oversight and direction of your spiritual father. If you have any specific questions about how the fasting discipline applies to you, you should consult your spiritual father. In the case of All Saints parishioners, you should seek guidance from Fr. Nicholas. WEEKDAYS are Strict Fast Days. On these days we abstain from meat, dairy, fish with backbones, fowl, wine, and oil. SATURDAYS and SUNDAYS are Wine and Oil Days. On these days the fast is relaxed to permit wine and oil, but we still abstain from meat, dairy, fish with backbones, and fowl. The one exception to these general rules is that the Great Feast of the Holy Transfiguration of our Lord, God, and Saviour Jesus Christ (August 6), which always falls during the Dormition Fast, is celebrated as a Fish, Wine, and Oil Day. On this great feastday, the fast is relaxed to permit fish with backbones, in addition to wine and oil, but we still abstain from meat, dairy, and fowl. On Monday, June 12, we begin the Apostles’ Fast, one of the four canonical fasting periods of the Church year. The Apostles’ Fast always begins the Monday following All Saints Sunday and ends on June 29, the feastday of Ss. 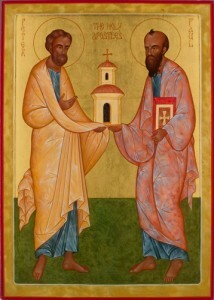 Peter and Paul, Chiefs of the Apostles. The duration of this fast varies each year depending on the date of Pascha (which determines the date of All Saints). This year, our journey through the Lenten fast to Pascha begins at Forgiveness Vespers on Sunday, February 26. The Church, in her wisdom, begins preparing us for this most-holy time in the weeks that precede the fast. This post will provide you with the fasting guidelines for the pre-Lenten period of preparation, Great Lent, and Holy Week, according to the general practice of All Saints parish and as approved for publication by Fr. Nicholas Sorensen. February 5 is the Sunday of the Publican and Pharisee and the week that follows (February 6 – 12) is fast-free. There is no Wednesday or Friday fast this week. February 12 is the Sunday of the Prodigal Son and the week that follows (February 13 – 19) is a normal week. Wednesday and Friday of this week are fasting days. February 19 is Meatfare Sunday (the Sunday of the Last Judgment) and on this day we say “farewell” to meat. During the week that follows (February 20 – 26) we fast from meat only. All dairy, cheese, eggs, wine, and oil are permitted during this week, even on Wednesday and Friday. February 26 is Cheesefare Sunday (the Sunday of Forgiveness) and on this day we say “farewell” to cheese, dairy, eggs, wine, oil, etc. This begins the fast proper. WEEKDAYS (Monday – Friday) are observed as Strict Fast Days. On these days we abstain from meat, dairy, fish with backbones, fowl, alcoholic beverages, and olive oil. WEEKENDS (Saturday and Sunday) are observed as Wine and Oil Days. On these days the fast is relaxed to permit alcoholic beverages and olive oil. In addition, two special feastdays that fall during this period – Annunciation (March 25) and Palm Sunday (April 9, this year) – are kept as Fish, Wine, and Oil Days. On these days the fast is relaxed to permit fish with backbones, in addition to alcoholic beverages and olive oil. Great and Holy Thursday (April 13, this year) is observed as a Wine and Oil Day due to the commemoration of the institution of the Eucharist. Great and Holy Saturday (April 15, this year) is observed as a Strict Fast Day – the only Saturday of the year kept as a strict fast; however, wine (but not oil) is permitted. The Nativity Fast begins this year on Tuesday, November 15. This fast helps us prepare to properly celebrate our Lord’s nativity in the flesh and it is to our benefit to observe it as fully as possible. THANKSGIVING DAY — Our bishops have decreed that the faithful of the Antiochian Archdiocese in the USA may relax the fast entirely to observe the Thanksgiving Day national celebration, which falls on November 24 this year. 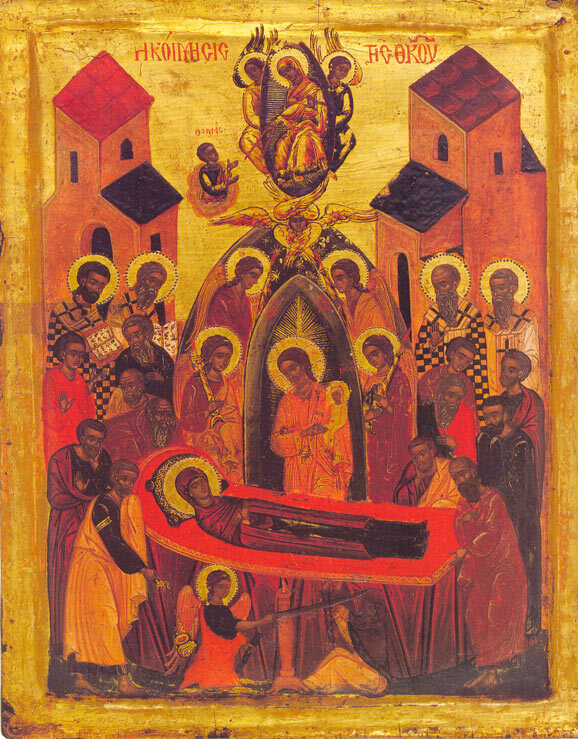 On Monday, August 15, we will celebrate the Dormition of our Most Holy Lady, the Theotokos and Ever-virgin Mary. In preparation for this great feast of the Mother of God, we observe a two-week period of fasting from August 1-14.